Happy May Day! One of my favorite times of year, the celebration of fertility, and of new life. 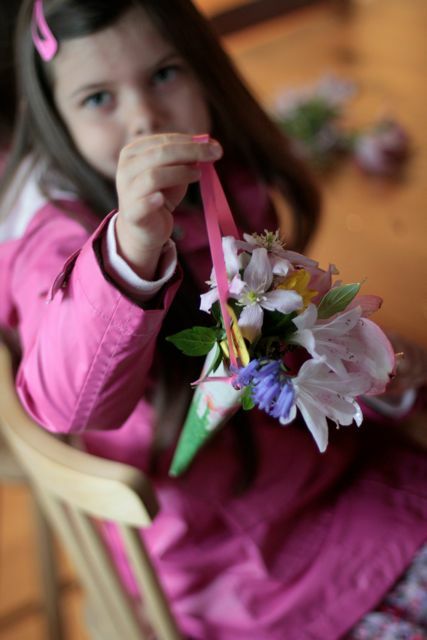 Our May Day began with rising early and dressing quickly so we could go out and pick flowers to fill May Day baskets. 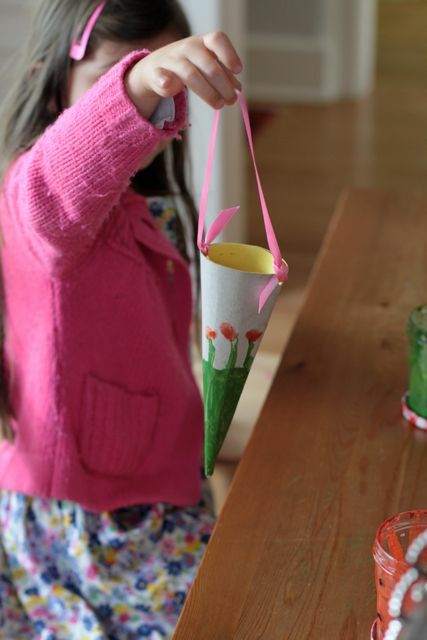 Last night we made some simple cone shaped baskets out of cereal boxes from the recycling bin. We decorated them with ribbon and water colour paint. 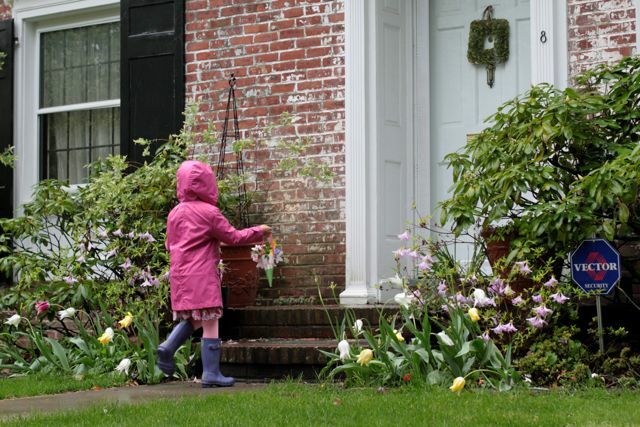 For those of you not familiar with this tradition, May Day baskets are small baskets usually filled with flowers or treats and left at someone’s doorstep. The giver rings the bell and runs away. The person receiving the basket tries to catch the fleeing giver. If they catch the person, a kiss is exchanged. 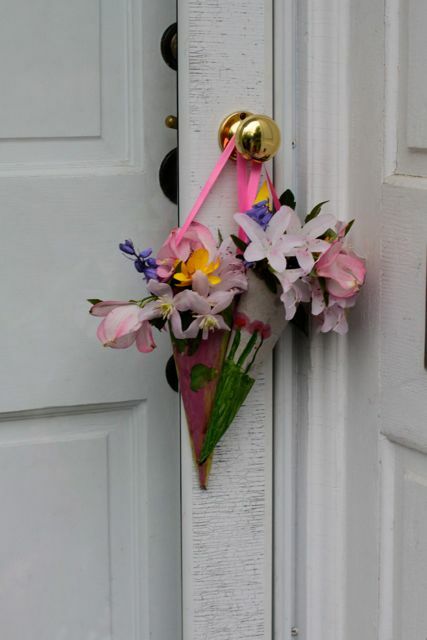 We left May Day baskets on Nina’s door step. 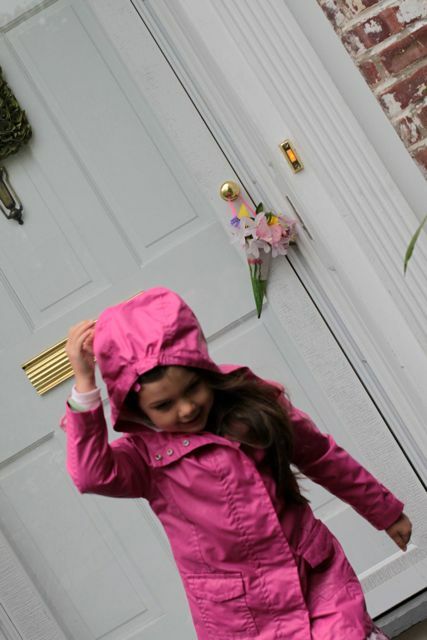 Before 8am the Girls rang her doorbell, and ran to hide. It was very early and so Nina was not expecting visitors, but kindly answered the door like a sleepyhead anyway! 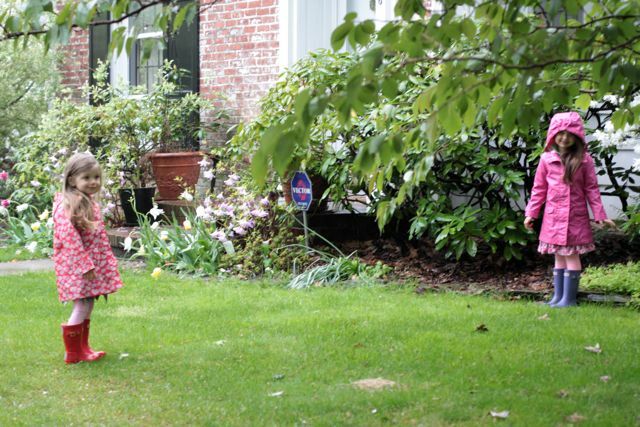 Thankfully – with delight, she found the May Day baskets, and two giggling little Girls behind the bushes. 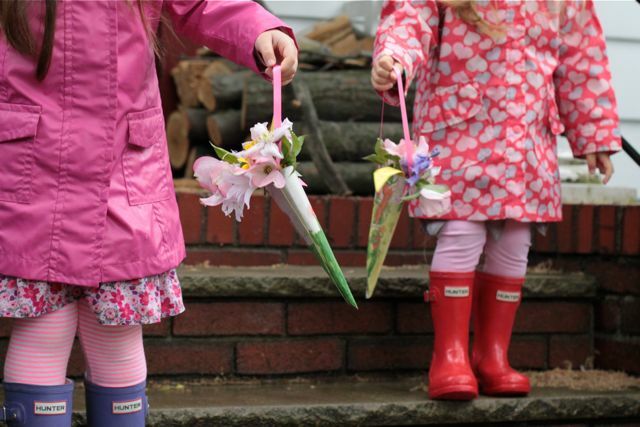 Maya’s school celebrates May Day with a maypole, which the children have been practicing for the past few weeks. The Maypole event is a combined school event with two other local schools. Sadly though, we heard at school drop off that Maypole had been cancelled due to the rain. I spoke with Mrs Hopper our school principal and she said that she planned on organising another Maypole day for our school on the 11th of May. 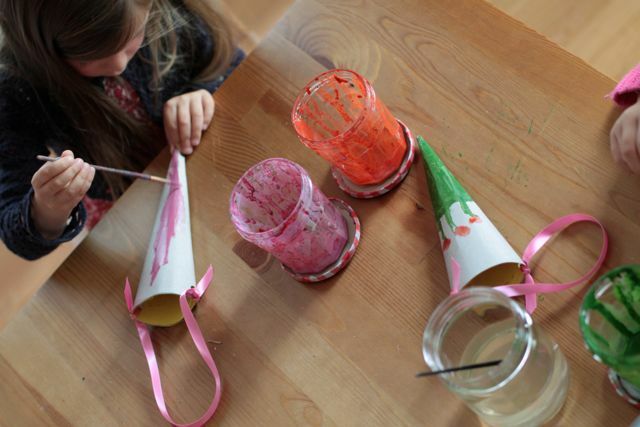 We intend on heading to Brooklyn this weekend to attend the annual Waldorf Playgroup Maypole event. I am really excited as it is the most wonderful day, so incredibly beautiful. I look forward to maypole all year. This will be our first trip back to Brooklyn since moving, 9 months ago. It will be a special day for us, seeing friends, and being a part of this magical ritual. At this point rain is predicted for the weekend…fingers crossed it does not dampen our spirits. Happy May Day to you my friends! This entry was posted in C R E A T E and tagged may day, waldorf. 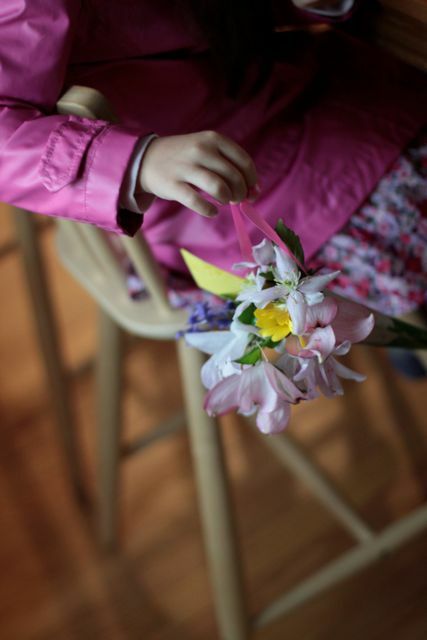 You and your flower girls have been a breath of fresh spring air in our lives! I am so grateful…. Awww….you are sweet. We missed seeing you today. We are grateful for you too my friend, so very grateful.